A problem that is bigger than global warming | Watts Up With That? In light of what happened yesterday, this story is even more relevant now. It was written before the meteor event in Russia. While politicians, their activist friends, and pundits caterwaul over a few tenths of a degree change in the global temperature over the last 100 years, with some Ehrlich-like nutballs even claiming it will cause extinction of humanity, today might be a good day to recognize a real extinction level challenge humanity faces. The likelihood in this century of an asteroid impact with 700 times the destructive power of the Hiroshima A-bomb: 30%. In the game of cosmic roulette that is our solar system, we just got lucky. Earth will get a very close shave on Friday, Feb. 15, when Asteroid DA14 passes just 17,000 miles from our planet. That is less than the distance from New York to Sydney and back, or the distance the Earth travels around the sun in 14 minutes. We are dodging a very large bullet. The people of Earth also are getting a reminder that even in our modern society, our future is affected by the motion of astronomical bodies. The ancients were correct in their belief that the heavens affect life on Earth—just not in the way they imagined. Sometimes those heavenly bodies actually run into Earth. That is why we must make it our mission to find asteroids before they find us. The last major asteroid impact on Earth was on June 30, 1908, when one about the size of an office building (140 feet across) slammed into Siberia with a destructive energy 700 times that of the atomic bomb dropped on Hiroshima. That asteroid devastated a region roughly the size of the San Francisco Bay area. Asteroid 2012 DA14, which will be passing over our heads on Friday, is about the same size as the asteroid that devastated Siberia’s Tunguska region. . . . The chance of another Tunguska-size impact somewhere on Earth this century is about 30%. That isn’t the likelihood that you will be killed by an asteroid, but rather the odds that you will read a news headline about an asteroid impact of this size somewhere on Earth. Unfortunately, that headline could be about the destruction of a city, as opposed to an unpopulated region of Siberia. . . . The chance in your lifetime of an even bigger asteroid impact on Earth—with explosive energy of 100 megatons of TNT—is about 1%. Such an impact would deliver many times the explosive energy of all the munitions used in World War II, including the atomic bombs. Full story here at the WSJ. During the hours around closest approach, the asteroid will brighten until it resembles a star of 8th magnitude. Theoretically, that’s an easy target for backyard telescopes. The problem is speed. The asteroid will be racing across the sky, moving almost a full degree (or twice the width of a full Moon) every minute. That’s going to be hard to track. Only the most experienced amateur astronomers are likely to succeed. For the rest of us, NASA will broadcast the asteroid’s flyby on NASA TV. We are completely defenceless against an asteroid that would come to us in the glare of the Sun. We would only be able to see it at the very last moment. Another point…instead of miles it’s better to think asteroidal misses in terms of minutes. How many minutes between the asteroid getting nearer to Earth, and Earth being there where the asteroid will pass by? I reckon, around 20 minutes. So the asteroid is missing us by just 20 minutes. If it was from a long time ago, then the Yarkovsky effect kicks in. Given the fragments are highly unlikely to be the same size, they would have diverged in orbit over time by considerable distances. I’m not so impressed. 700 x Hiroshima is about 20 megatons. The Russians DID detonate a 50 megaton bomb which killed nobody, which of course was detonated where they expected no one to be killed. The point is that these really big bombs/metorites will only kill people in the immediate vicinity of the impact. Kind of equivalent to being hit by a big earthquake which happens quite often. Great point concerning the relative danger. Also, the risk of nuclear war which it seems to me is becoming ever more grave as unstable nations ruled by unstable people inevitably acquire the technology. Door number 1, a nuclear winter. Door number 2,a degree or two C if warming. Which would a sane person choose? Antony, There’s something faintly hysterical about your position on this. From what I’ve heard the above is the worst of it. This has nothing to do with whether we fund climate research or not. Too bad this thing didn’t fly by in December so the end of the Earth doomsayers could have had a go with it. But then again it gave them a couple of weeks worth of something to worry about to help ease their letdown that the Earth wasn’t destroyed then. But then there is always the standard fallback of carbon dioxide to bring doom. Worrywarts. When it’s finally accepted that carbon dioxide is beneficial to our atmosphere they will need to find something else to worry about. What’s next? This appears to be a very steep angle to the ecliptic. For most of the approach the South Pole is clearly visible. From memory I think the 1908 Tunguska event was also preceeded by a comet passing by, so perhaps smaller events are common after these near earth fly-bys. According to SpaceWatch, your chances of being killed by an asteroid/comet impact are higher than your chances of dying in an airliner crash. Although such an impact only occurs perhaps once in 100,000 years, it would kill a third of earth’s population. Airliner crashes while much more frequent only cause the death of a few hundred a year. While we’re in catastrophe mode, consider the possible consequences if an event like yesterdays Urals impact had coincided with the North Koreans testing a missile. Someone jumps to the wrong conclusion and then oops. This is where NASA should focus more on than the phantom of catastrophic warming. They would really be doing the people of Earth a great favour. Of all the people in NASA Dr James Hansen, the astronomer should be more aware than most about the dangers from space. There is an even bigger asteroid: Itys – the black headed meteor, which has buzzed the planet at least four times since 1985. On each pass it spent some time passing through Earth’s atmosphere, once it may briefly have been in the troposphere -2003. The last sightings of which I am aware was in Queensland Australia, July 17th, 2011. You can track this down on lunar meteorite hunter. While it is not described as an asteroid the head is described as being black which means that the image on the retina is not size enhanced by scattered light. From my first sighting in 1985 I was able to estimate its diameter as being >1.75 miles. At the time it was directly overhead and silent and subtending about 4 degrees at the eye (the size of my fist at arms length or perhaps slightly smaller). As even the space shuttle creates a sonic boom at ground level from a height of 25 miles and as it was completely silent (and awesome beyond description) we can estimate the minimum size. So when will NASA let us know about this? Never. It is NASA/US government policy to keep quiet about “the big one” so you will never get to know until the white flash comes. How long have we got? I think the next pass will be 2014 going 15. It is getting close to staying and if we survive this pass look to 2018. I have rather nice artwork on Itys, and if WUWT would like to post a copy I will send one in just so you know what an asteroid passing through Earth’s atmosphere looks like. Have any of the climate scientists and their warmist acolytes in the MSM and elsewhere, claimed the meteorite shower in Russia and the approach of this asteroid are due to climate change? An asteroid striking the earth would be the ultimate irony; mankind busy “studying” a mythical manmade problem and the universe giving it that problem for real, in spades. I swear, instead of evolving, it sometimes seems the human race is devolving. Bird or Swine Flu, Solar EMP, or Asteroid Strike all of these are of more concern than AGM or it’s variants. But there’s a 75% chance it’ll happen over the ocean somewhere and thus do no damage, other than providing a light show for remote sensors. And then there’s the Sahara or any other number of desolate places where even a Tunguska event could pass virtually unnoticed. As far as the odds of world ending impacts occurring, I prefer to go with the observed frequency rather than the calculated ones. And right now that’s once every 66 million years, and counting. What impact would this particular meteorite have if it had landed in the Ocean??? I never really hear what the thought is of Meteorite’s Tsunami threat. Any ideas??? Perhaps we are lucky it landed on land. Also, the passage in you know where regarding ‘Chernobyl’ or ‘Worm-wood’, the mountain that fell from the sky speaks of a ‘third of the ships’ and seems to describe the same event twice, or, chronicle a double meteorite hit. A puzzle I didn’t understand but then I saw the Levy-Shoemaker event and thought hmmmm… i’ve read about this jkind of event before. As I understand it, the two trajectories were not similar. Here is fascinating interview detailing what we have to consider and plan for NOW, when dealing with future threats. Events of today just reinforce the need to get our act together. And fast. Simply launching a few nukes into space to combat the threat of asteroids is not so simple. I thought the last decent hit was actually 1947, not 1908. An impact to the ocean would trigger several mamas of a tsunami from the resulting ripples. “No damage” is understating things considerably. “The oceans cover about 75% of the Earth’s surface, so it is likely the asteroid will hit an ocean. The amount of water in the ocean is nowhere near large enough to “cushion” the asteroid. The asteroid will push the water aside and hit the ocean floor to create a large crater. The water pushed aside will form a huge tidal wave, a tsunami. The tidal wave height in meters = (distance from impact)-0.717 × (energy of impact)0.495/ (1010.17). What this means is that a 10-km asteroid hitting any deep point in the Pacific (the largest ocean) produces a megatsunami along the entire Pacific Rim. Is it time to move the doomsday clock closer to midnight? Great. Do you really want to give collectivists another potential excuse to take over the world. We’d be much better off taking the occasional hit for now. In a hundred years, the world will likely be much better able to deal with this sort of thing. 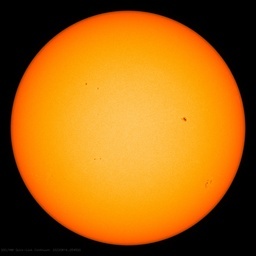 There has been considerable confidence for a year that 2012 DA-14 will not strike Earth. Had there been confidence that it would strike, would the news have been released sooner or later? The coincidence of the Siberian meteorite strike drives the point home. There is a link between belief in (and fear of) catastrophic anthropogenic global warming and complacency surrounding risk of an asteroid strike, perhaps stemming from a kind of cultural narcissism (hey, there’s one for Lewendowski..): Many people find it hard to grasp of a time scale greater than their own lifetime, or events outside their sphere of experience. Therefore, weather patterns / temperature swings not commonly seen in decade become alarming and unprecedented, and asteroid strikes occurring over a hundred years ago become abstract events. @wws: The world is a great deal more populated than it was 100 years ago, and an asteroid strike does not have to be on a Jurassic scale to cause a disaster, human or environmental. I understand the Siberian event did not leave much of an impact crater. Before the rise of the mass media, how many strikes in now populated / coastal areas would have gone unnoticed? Serious asteroid strikes may be a lot more common than we like to believe. A similar event was captured from Perth on the 12th March 2005. No air burst was reported as it was ( from memory ) to have crossed the coast between Albany and Esperance in southern Western Australia. Fascinating video. Night becomes day for a few moments. N. N. Taleb addresses the statistics of unique events in The Black Swan: The Impact of the Highly Improbable. This after Taleb and collaborator Benoit Mandelbrot called reality “fractally comples” while arguing against ignorant use of induction – connecting the epistemological dots in chart junk. Well, sooner or later there will need to be a cull of the world population? We could of course divert the huge funds spend on climate research into space systems that can protect us from incoming? No? The possible fragment that hit in Russia had a lot of energy. If it were a fragment there may be other fragments. As much as I’d like to believe this, I really don’t see any evidence to support such a belief. Take away the sense of immediate threat, and people will simply ignore and/or avoid any potential problem. This is the principle the AGW alarmists are using to hype their cause: continue the drumbeat of “immediate threat”. Currently people are not too thrilled with any sort of large weapons projects, so I don’t foresee the development of, say, gigaton class warheads coupled with delivery systems capable of intercepting a hypervelocity incoming threat. Even if the technology exists, enough people have cried “wolf” enough times that it’s very difficult to even convince people of a real threat, even if it’s identified in time. Heck, it wasn’t even possible to evacuate New Orleans when a monster hurricane was headed straight toward it with days of warning, and don’t get me started on the unnecessary damage caused by Sandy. People are complacent. It’s easy to just assume someone else has a handle on major issues. We think our technology and destructive potential is so great, but the fact is humans are pitifully unprotected and ineffective and will probably remain that way. Admitting that we don’t, in fact, have the capability to in any way protect ourselves from a real and tangible threat would demonstrate the reality of our inability to change climate or damage the planet, EVEN IF we were deliberately trying to do it. Collisions with asteroids large enough to cause global damage are extremely rare, and the current effort to chart them all so we can see if any has an orbit that intersects Earth is at a reasonable level. Also missions to study asteroids up close are useful so we know what they are made of helping coming up with a good way of deflecting one. A nastier scenario is a meteor hitting one of the more unstable areas on Earth. Israel, North Korea, Pakistan or India might be nervous enough to assume it was a nuclear attack and “strike back”. What dd he say just a few days ago? What a jerk…..950 people injured….He knows nothing. One wonders if yesterday’s meteor in Russia wasn’t some parts of the asteroid fragmented in a deep space collision eons ago and in a similar trajectory hours ahead. No. It came from a different direction. I thought we had decided that the Tunguska event was caused by a comet, not an asteroid. No residue found at the impact site was supposedly evidence against its being an asteroid. Asking that we should forget about CAGW because of the meteorite problem is faulty logic. Should you stop washing your hands after using toilet because there’s also danger that an aircraft may crash into your house? Putting such two things as if one somehow disqualifies the other is just wrong. There sure are good reasons why we should stop destroying our economy but meteorites are not one. As far as I know, the danger of something hitting the Earth from space is recognized for quite some time and there are teams of astronomers and automated equipment dedicated to that problem and on constant lookout for anything that can appear in Earth’s close proximity and is big enough to cause problems. Real problems, not just few thousand broken window panes such as in Russia now. Thousands of such objects were found and their trajectories are known with sufficient precision and that’s also the reason why this time it’s very well known what object is passing us, how far and especially that it poses no danger not just now but also in 20-some years when it will appear again. There’s not much more that can be done about it – this is exactly the ‘diminishing returns’ case, by putting twice the money into it, you get just a somewhat better result. Yes, we may get hit by an asteroid. We are already doing our best to make sure it doesn’t happen without us knowing in advance and being able to at least try to do something about it. I competely agree, Anthony. Imagine even if we had 1% of the money wasted on global warming for a proper asteroid tracking program. for kcrucible: When referring to an ocean strike, I was referring to a Tunguska event, which is also what the the 30% odds are referring to. That was estimated to be an object (asteroid? ice comet?) about 100 meters across, and as you recall, it exploded in the air with no ground strike ever discovered. An event like that over the ocean will NOT cause any huge tsunamis anywhere – just a big bang for any boats nearby. Note that the atomic bomb tests on the south pacific atolls did not produce any significant tsunamis outside of an extremely local area, and those were approximately similar in yield to the Tunguska blast. I read through the Journal article. While the science is interesting, it struck me mainly as yet another group of hungry scientists attempting to use statistics to secure a long term career revenue source. The future for Apophis on Friday, April 13 of 2029 includes an approach to Earth no closer than 29,470 km (18,300 miles, or 5.6 Earth radii from the center, or 4.6 Earth-radii from the surface) over the mid-Atlantic, appearing to the naked eye as a moderately bright point of light moving rapidly across the sky. Depending on its mechanical nature, it could experience shape or spin-state alteration due to tidal forces caused by Earth’s gravity field. correction, “Chicxulub” – I’ve seen it spelled differently elsewhere. There are several things that can happen again that are far worse than 2 degrees of warming. 1. Yellowstone/other super volcano going off. 2. Megatsunamis caused by volcano sides sliding into the ocean. 3. Going into another glacial period. And none of them are or can be effected by man. Be careful about making this point too strongly. There is nothing to stop Ms. Boxer from slipping an Asteroid Tax into the mix. Maybe I didn’t look hard enough, but I couldn’t find the above at the link provided. So what size asteroid would kill 1/3 of earth’s population? The comment sounds like something the SpaceWatch’s equivalent of James Hansen would put out there to increase his funding. But I agree with Anthony, I’d rather defund the CAGW clowns and give it to anything to do with space. I became an engineer because I figured that was my ticket to be on living on Mars by now. Upon its discovery in 2004, Apophis was briefly estimated to have a 2.7% chance of impacting the Earth in 2029. Additional measurements later showed there was no impact risk at that time from the 210-330 meter (690-1080 foot) diameter object, identified spectroscopically as an Sq type similar to LL chondritic meteorites. However, there will be a historically close approach to the Earth, estimated to be a 1 in 800 year event (on average, for an object of that size). There is an even bigger asteroid: Itys – the black headed meteor, which has buzzed the planet at least four times since 1985. On each pass it spent some time passing through Earth’s atmosphere, once it may briefly have been in the troposphere -2003. The last sightings of which I am aware was in Queensland Australia, July 17th, 2011. You can track this down on lunar meteorite hunter. No links? A google search brings up nothing except your comment here, and another very brief comment on a different site, mostly talking about DA14… I’m calling BS unless you can bring something other than “artwork”. With all the amateur astronomers out there, something would have been in the news. I have always wondered if one could break up a lager meteor into smaller chunks to increase the likelihood of air bursts rather than one large crust shifting impact. Either way it is going to cause a great deal of damage, but if a 10km beast strikes the damage will be tremendous, if 1000, 100m ones were to strike, spread out over the circumference of the Earth, it would still be horrible and kill many people, but probably wouldn’t cause massive geological reactions or cause dust and forest fires that leave a geologic layer around the world. The idea that asteroid 2012 DA14 will miss earth by just 15 minutes is lame. “The Science Guy” used this too. The asteroid and the earth orbits do not intersect at any point. If it came 15 minutes earlier or later, it would just be further away. The idea DA14 and this asteroid that flew over the Chelyabinsk region are in any way related is also false. As others have pointed out, their orbital inclinations are almost 90 degrees apart. Different objects. Still an interesting coincidence. NASA seems so proud to be following DA14 but missed this entirely. Of course this one was a lot smaller but it shows that what we can detect and what can do damage are different. You may be right, but I’m not sure I’m convinced. Look at it this way. I seem to remember reading some recent news article claiming that we needed to spend about 700 billion dollars to combat climate change. That’s some serious cheddar. What could our space program accomplish with that sort of funding? I mean, we wouldn’t be talking about incremental improvements to asteroid monitoring with that sort of money. How much would it cost and how long would it take to get humanity a leg off this planet, anyway? I’m not sure, but maybe if we’re going to spend grotesque amounts of money because we’re worried about the future, maybe our hundreds of billions would be better spent moving in that direction instead. ‘AT 9:30 am…’ Whose time zone? You should carefully state such a crucial piece of information by defining something like ZULU or EST etc. It’s either gone by me, or I’m still in the way. Roches limit applies to bodies that are held together solely by gravity (which is a very good approximation for large bodies). Such a small body as this however is likely to have some mechanical cohesion as well, so it should survive passing slightly inside the Roche limit. Are any of the above more likely to happen and to be of greater negative consequence than man-caused climate change? For an imaginary danger we will waste billions and restrict individuals freedoms. For a real problem, we will bury our heads in the sand, huddle at the bottom of this gravity well and deny the coming asteroid. Ditto a year without summer, we will starve because there is no grain reserve anymore. Both asteroid strike and loss of a growing season across the northern hemisphere, have happened before. (Imaginary) CAGW, has not even been measured yet. The use of CAGW as an excuse to not prepare, for real events is inexcusable. My leaders are proving themselves to be insane, as they focus on the surreal and deny reality. I have a solution! We have a lottery, or lotteries if taken global, to pay for impact defense technology. We can call it the Power Bol-ide Lottery. I would be a darn decent choice to run it, btw. Reason being my hatred for corruption and as a bowling league secretary in the past I was never funny with the moneys. I even donated my pay so there could be a small trophy and payout for best split conversion and most strike ball gutter balls to make it more interesting. Might even use any left over cash to pay down the national deficit! Does anyone have an idea of what happens to a meteorite when it hits an ice field? What happened during the last ice age, to incoming meteorites hitting north america? Do they explode because of the temperature differential? Does the ice help dissipate the impact forces? Ice is very different, would the meteorite have a better or worse chance of surviving intact? A major asteroid impact is very highly probable – the only question is when. <a href= This problem is a far greater danger than any of the posited catastrophic anthropogenic climate threats. The likelihood in this century of an asteroid impact with 700 times the destructive power of the Hiroshima A-bomb: 30%. . . .
For context, the Chicxulub impact likely caused the Permian extinction. A bolide of about 10 km (6 mi) in diameter caused the Chicxulub crater in the Yucatan Peninsula, Mexico more than 180 km (110 mi) in diameter. Covey, C; et al. (1994). “Global climatic effects of atmospheric dust from an asteroid or comet impact on Earth”. Global and Planetary Change 9 (3–4): 263. Bibcode 1994GPC…..9..263C. doi:10.1016/0921-8181(94)90020-5. NASA has a “Near Earth Objects Program” to begin to identify objects that could fly near or potentially impact earth. However this is woefully underfunded compared to the very real dangers involved. Contrast the billions of dollars spent on “climate” and the trillions proposed as new taxes. We would be far better off reallocating > 85% of “greenhouse” or “climate change” research to this Near Earth Objects Program, and focus on civil defense ways to respond and possibly mitigate such impacts. Call your legislators and appeal to common sense. Comments by Roy Spencer and <a href= Anthony Watts that this Russian bolide is a fragment of 2012 DA14 make alot of sense. See the Shoemaker Levy asteroid string that impacted Jupiter with 21 observed fragments. The Shoemaker-Levy asteroid impact on Jupiter in 1994 caused explosions equivalent to 6 trillion tons of TNT. Contrast the global nuclear arsenal of about 30,000 nuclear warheads only has the potential of 5 billion tons TNT. Similar patterns of multiple impact craters have been identified on earth. A >5 km diameter asteroid appears to have struck the Timor Sea with an associated impact cluster around the globe. While asteroid mitigation may be a ways off, awareness will help in civil defense preparedness. Since we have seen Shoemaker – Levy “shake” Jupiter, that suggests we can expect to see another similarly visible impact. Only if it is an asteroid – for a comet on an earth-intersecting orbit we would at the best get a few months warning. If it was coming from the other side of the Sun perhaps none at all. And we don’t know about all earth-crossing asteroids either, new ones are constantly being found. No. It is not possible to move that much momentum to such a distance or accurately enough. Certainly not possible with near term technology. It is a good exercise for an undergraduate physics class. What is the priority of dealing with man-caused climate change in relation to other threats to life on earth, a few of which I enumerated in an earlier post? The Shoemaker-Levy asteroid appears to have been broken up by Jupiter’s gravity for passing within its Roche limit. Earth’s Roche limit is about 17,880 km (10,560 miles) for a solid body. The 17 km distance of of 2012 DA14 appears to be within that estimate of Earth’s Roche limit. There’s a lot to be said for building an asteroid defence shield: new technolgy; jobs; new space drives; a reason to accept taxes; morale improvement as the whole world works to a common aim. We could call it The Cause…. Compare that to the AGW scare — fewer jobs, backward technological development, poverty, unemployment, all negative. I have imagined our reaction to an incoming impactor in a short story called ‘Hittile’ in my ebook Lucifer Falling, with the asteroid defence chain degraded as politicians have spent the money on trivia and votes instead of matters that really matter. ROUGH MAGIC lurched as the Hoplite blasted free. “Hoplite to Guardian, take cover. Hoplite slewing now. Firing in thirty seconds. Take cover.” The speakers took up the refrain. A controller grabbed Carradine. They fell together down some steps into a dingy hole below the seats. The woman’s face was wet with sweat. “If she blows up we’ll get zapped. Three metres of lead here.” They held their breath. Much later Carradine saw the holo of the launch, shot from Longstop. The Hoplite broke free of the wheel in an explosion of sparks and debris. She swung smoothly into position, then ignited her main engine. Bombs fired one after another, three a second, a searing glare that cut out all other vision, exploding just behind the huge buffer plate, enormous shock absorbers bouncing under the titanic strain of each impact. Hoplite stood on a pillar of flame and streaked away. Big as a supertanker, fifty years old, the hittile was up and running. It might be worth summarizing what we know about the frequency of large bolide impacts on Earth. We know about approximately 30 craters or crater groups younger than one million years. None of these is under the sea or in Antarctica or Greenland, so we can safely multiply by at least 5 to get the total number of impacts during this interval. Furthermore we have certainly not found every crater on land yet – new ones are being added every year, and many of the smaller craters have certainly been completely eroded away or covered by loose deposits, particularly if they occurred in an area that has since been covered by ice during an ice age. It would seem that a very conservative guess for the number of crater-forming impacts during the last million years would be about 200, or one every 5000 years. Note that these would all be considerably larger than the Tunguska event, since they made it down to the surface without disintegrating. The largest known impact during the last million years was Zhamanshin in Kazakhstan which is 19 km (12 miles) across. Barringer Crater in Arizona is the fifth largest of the 30. Correction: The 2012 DA14 will pass about 17,220 miles away (not 17 km) so OUTSIDE the 10,560 mile Roche Limit. Any real problem, even a very very very small one, is bigger than global warming. If DA14 will be passing earth from south to north, at what longitude will it be more or less overhead at its closest approach? There are now reports (nothing from a site I would deem reliable) that a meteor has also exploded above central Cuba. In re comet versus asteroid. The difference between comet and asteroid is tail and composition. An asteroid can be a comet with its volatiles making the tail cooked off. That’s the point Jeff there are no affects of man that can have an effect on those things. Effect: the power to produce results. We have none. It doesn’t seem to have occurred to anyone yet that any device or system which can alter the trajectory of an asteroid fragment could just as easily *cause* an impact as prevent one. It all depends on who’s in control of it; what would happen if one of the various Kims in NK got his hands on the controls? Stand back and think; would any sane society build a weapon which had the capability of destroying civilization in one shot? Any asteroid deflector would have that capability; we would be looking at a true Doomsday Device. I feel much safer taking my chances with nature than with man. What I consider an “abstract event” is something which has never caused a significant loss of human life in all of recorded history. This entire topic is literally Chicken Littleism. I can accept the estimate of a large strike once every 5000 years; but something that only happens on that frequency is not something that makes me want to jump up and create some version of the Death Star tomorrow. I would be very surprised if this event doesn’t affect building standards to some degree. Uh no. Tunguska “devastated” 900 square miles, about the size of modern urban Paris (1100 sq. miles 2010). ~shrug~ Science, technology, heck even knowledge in general is always a double edged sword; in most cases what can be used for beneficial purposes can be used for malevolent purposes as well. I don’t find the notion of possible misuse all that persuasive an argument to dissuade advances like this. I heard early on TV (ABC GMA) that the CHELYABINSK fireball meteor and the 2012DA14 asteroid were unrelated and coincidental, but I wanted more information, which I’m unlikely to get on that station. It seems like these are very close together. But that is a frames-of-reference problem. First off, just how close together were they in time? 2012DA14’s closest approach is 2013.02.15 19:25 UTC. The difference is 16.033 hrs. The earth travels around the sun at 107,279 km/hr. Add to this fact that 2012DA14 is traveling from south to north and the Chelyabinsk meter seems to have a north to south component (down and right looking at the morning dawn) and east to west when looking south from the dawn. So they are likely traveling in very different directions intersecting with the earth’s orbit 16 hrs and a million miles apart. It seems clear that this is a cosmic coincidence and proof that the two rocks are unrelated. What is less clear is whether there is a God has a sense of humor. What better way to get humans to pay attention to the 2012DA14 close call in a few hours? My personal view is that God does play dice. It is an open question whether sometimes the dice are loaded. A toast: Here’s to making a Pass in 2 hrs. While I was investigating N. hemisphere’s magnetic field I came across Nastapoka arc, the Canada’s greatest natural ‘wonder’, near-perfect circular arc, covering more than 160° of a 450 km diameter circle at the edge of the Hudson Bay. The area is one of the globe’s deepest gravity depressions and until about 1997 had the strongest magnetic field in the northern hemisphere. Here is a sky map from Heavens-Above.com that shows the sky track against the stars for 2012DA14 as seen from Colombo, Sri Lanka. It is 23:30 at the time of this post, passing in front of the arm of the Milky Way. If it was a fragment of the asteroid 2012 DA14, as it approached closer to Earth on the same trajectory and as it was pulled in it is possible for it to have a east to west trajectory, I think NASA and some other astronomers have jumped the shark on this event declaring it a coincidence, everyone should wait for the evidence to come in, there are reports now coming from Russia that this meteor was spotted and a warning had been given. Tunguska has been tied to the Taurid Complex, which is cometary in nature. I would suggest that comets are a greater threat than asteroids, as they come from all angles. Asteroids tend to cluster around the plane of the ecliptic. Comets also fragment easily, with several being observed and photographed over the last few decades (Linear, Shoemaker – Levy 9, Schwassmann – Wachmann 3, Elenin). Once the pieces quit outgassing, they are very dark and difficult to track. Of course you have the problem that there is not a strong dividing line between what is an asteroid and what is a comet. Up to half of the Near Earth Objects are thought to to be inactive comets. A few asteroids have been observed with a tail. It can be seen from seafloor isochrons that the destruction of the earth’s crust from the Club Med impact is not terribly impressive. The angle of incidence seems very important and it could be that the isochrons record the incoming side of a steeply angled impact. Another possibility is that an impact nearly square would leave only a bullet hole. Regarding altering the course of history, it ihas been suggested that the Majuika impact may have destroyed the Ming Fleet just as they seemed poised to beat European civilization to the punch in colonization. Err, can someone in the know please explain why the objects of smaller mass could not simply have been caught by the Earth’s gravity, and looped around the sphere of our planet in an unstable orbit, thus appearing (to an Earthbound observer watching the angle of impact near the surface) to have a different angle of approach from the main asteroid? I don’t trust myself with the math of this scenario—the approximate, since estimating the exact mass of a fragment or fragments during approach might be a problem—but it seems plausible to me, contrary to the NASA claim. Another Heavens-above.com sky map of 2012DA14. This one from Medan, north-west Sumatra, Indonesia, East of Sri Lanka at about the same latitude. This track is visably westward against the stars from the one from Colombo due to parallax. Can’t possibly see it in person from Texas, so arm-chair astronomy is the next best thing. “We are in a shooting gallery, and this is graphic evidence of it,” said former Apollo astronaut Rusty Schweickart, chairman emeritus of the B612 Foundation, committed to protecting Earth from dangerous asteroids. 02:30 am local time right now. Are they trying to snow us or what? Such a trival observation does not give any indication of its tragectory before it interacted with the Earth. An object coming towards Earth “from the South” that got captured could do half a rotation over the N. Pole and end up coming down in Russia “from the North”. That would invovle it passing over the Pacif instead of the Indian Ocean but what was the orientation and position of the Earth at the time it was captured. It beggars the imagination that NASA are prepared to make such a naive statement based on such little informations as ” In videos of the meteor, it is seen to pass from left to right in front of the rising sun”. This is a best a blantent attempt to reassure the public. It’s funny that the headline is an attention getter, because every problem is bigger than “global warming.” For at least the next 40,000 years, we’ll never enjoy again the pleasant conditions of the Holocene optimum, and might not even regain the warmth of the MWP. Colin Patrick Barth says:	February 15, 2013 at 10:17 am “Err, can someone in the know please explain why the objects of smaller mass could not simply have been caught by the Earth’s gravity, and looped around the sphere of our planet in an unstable orbit, …” They were – a looong time and many orbits ago so that almost all have been swept up by the Earth Moon system. The Solar System is old by the standards of life. Any chance of that airhead on that US TV news programme suggesting it was something to do with global warming? It seems likely to me that remains of the meteorite that struck in Russia will be found. Won’t analysis of that material enable scientists to prove or disprove whether it was a piece of 2012 DA14? The luminence of DA14 will intensify to a prominence of a magnitude 8 star, according to the article. What magnitude is necessary for a spectroscopic analysis? The Burkle Crater, a 30km crater under 3,800 meters of ocean, a mere 5,000 years ago. Coincides with the flood legends. The suggestion that the meteorite could “loop” around the earth and come from a different direction displays a fundamental ignorance of the of motion bodies in a gravitational field. In order for this to happen, the speed of the meteorite would need to be close to the orbital velocity of the earth, which depends on the distance to the earth. If the speed and tangential velocity were just right, then a body could get pulled into an orbital trajectory. If the speed was a little too low, it could “spiral” down and hit the earth like man-made satellites do when they run out of fuel. If the speed is too high, the trajectory may indeed bend, but the object will not strike earth at all. It will continue on its new path. The first problem is that this one was moving much too fast to be trapped by the earth’s gravity. Even if it were travelling more slowly (which it was not), a spiral orbit would be easy to observe from ground tracking instruments (and amateur observers all around the globe). So sorry, no NASA conspiracy here. Just physics. The brightest meteorite I’ve ever seen just flashed across the sky SE to NW, Australian WST 3:45 AM. No noise though. On Fox News: 2:04 pm CST: Video Cam from Michael Garnet. It WAS an “earth quake.” The shockwave hit the ground directly under the metor explosion. Then the ground deflection raced outward as Rayliegh Waves at 2-5 km/s (depending upon frequency) faster than the air shock wave. Isn’t that the usual trajectory for low earth orbit satellites in polar orbit (e.g. “spy” satellites)? Would be ironic if this was just a Russian satellite “coming home”. Apparently meteors of this size and explosive power happen are quite common and this is only news because of the asteriod. Oh, and because there are more cameras. Exactly how many humans have been injured from meteors in recorded history before this? Ummm…perhaps that is why it is news. According to wikipedia there are only 4 other recorded about same size explosion since 1908. …but I thought that was the imminent New Little Ice Age – publicized on the Village’s church notice board as recently as just over 3 years ago. Was that all just alarmism, or should we all continue to prepare for this catastrophic event? That is not a meteorite crater. IIRC, it’s called the Gates of Hell. Methane is burning. There is more to worry about down here than there is up there. Back in 2007 (not 2008 when we got around to noticing it) the global banking system went broke. We haven’t fixed it and it is not fixable and although we have not declared bankruptcy, bankrupt is what we are. There is no lender of last resort: no white knight. We are bust and we are on our own. The space advances commencing in the late ‘fifties were as much a matter of the ability to pay for the concerted effort, as it was to science and the superb engineering. Without the wealth, primarily of the United States, little could have been achieved. We now face a decade or two, of attempting to pull ourselves up by our bootlaces and developing asteroid deflecting technology in the meantime is likely to prove impossible. The CO2 nonsense and much else is likely to die a natural death. Stealey, may be! Will check. If you want to cower in fear of a virus, I’d recommend the coronavirus (pathogen of SARS). Otherwise, I agree with all (including A. Watts) that we should be afraid, very afraid, of an asteroid hit in the future. This is reason no. 1 for an inhabited moon base IMHO. The meteor that hit Russia had the complete opposite trajectory of asteroid 2012 DA14, if a fragment from this asteroid had been traveling ahead of it by a few hours or more it is far more likely that this estimated 10 ton rock had passed earth and slowed down as earth caught up with it and pulled it in, this would explain the north east to south west direction and it’s speed. Anyone declaring this a coincidence may as-well be calling it a supernatural event. Another fact is that asteroids do not usually travel alone, if this asteroid originated from the asteroid belt it would have been ejected by other impacts, which means there will be a trail of debris traveling in a similar orbit. NASA outright dismissing this event as a coincidence is irresponsible, It’s as though they are throwing out valuable information on what takes place during these close-encounters with asteroids. Their will be other flybys in the near future, Is the Russian Meteor evidence that shows us; even if the main asteroid safely passes by, there remains the danger of smaller objects of 10-30 tons traveling with the main object hitting us? The only thing this big rock reminds me is that our puny species needs to expand off of this rock we call Earth for ultimate survival… that alone would ease fears of resource depletion and over population.. The solar system has a huge rock pile with enough resources to last us well into our future. We are stagnant and until we have a frontier to explore as is the human’s nature… we shall continue to decline. Out there is an asteroid with our number on it. NASA should be concentrating its efforts on this rather than politically inspired AGW. Being a bit of a meteorite buff myself, one thing about the avoidance of an impact that I find foolish to the extreme is why they never contemplate trying to break the asteroid in to pieces shortly before it hits the atmosphere if the opportunity to deflect is insufficient. More of the impactor will be ablated if it is in multiple pieces. More of the cosmic velocity will be reduced by friction of the atmosphere, so the E=1/2 mv SQUARED kinetic energy will be substantially reduced(I estimate by 90%). A single large impact can penetrate into the earth’s mantle, causing a rupture on the other side of the planet and subsequent trap basalt eruptions along with deadly sulphur emissions, long term solar blocking and almost certain extinction of human life along with the cute and furry creatures the warmists seem to love above humans. The large single impact also will always spread a proportionally larger plume of ejecta high in to the atmosphere to block solar radiation with subsequent collapse of the food chain. A series of smaller ,say Meteor Crater (Arizona) size impacts will have that series of 100 mile devastation zones, but the rest of humanity will be probably be largely spared. 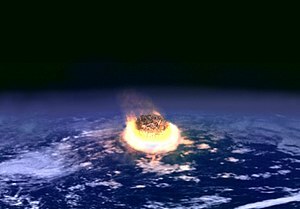 A single 10km asteroid impact would almost certainly render humans extinct. Life in the post nuclear winter would certainly be harsh to put it mildly. If it landed in the ocean (more than likely) the tsunami would bounce around all the oceans(multiple times) flooding many areas to 500 metres to a kilometre altitude ie half the world’s population in one hit.No way you could move the coastal populations out and a long way inland that quickly. Then the crop losses from no solar radiation. What would be the dominant food supply? Fellow humans of course. But how could this be sustainable for a couple of years? Even the cumulative effect of say 10,000 Meteor Crater size impacts would probably not create the deep mantle effects with subsequent crust rupture and volcanic activity . Although there would be a substantial reduction in solar radiation (warmists should be jumping with joy), the food chain is more likely to at least partially survive and probably a respectable number of species human and non human. Although life would never be the same again, humans, like the cockroaches, may survive the Holocaust. If sufficient energy is injected, will this not incur a strong possibility of disrupting the whole climatic system, stopping the cyclone-anticyclone circulation in both hemispheres for a considerable period of time,possibly causing a ice age? See the Shoemaker Levy asteroid string that impacted Jupiter with 21 observed fragments. The Shoemaker-Levy asteroid impact on Jupiter in 1994 caused explosions equivalent to 6 trillion tons of TNT. Shoemaker-Levy was a comet, identified by Gene Shoemaker’s wife Carolyn as an atypical fuzzball. Normally comets are round fuzzballs, this was elongated and people quickly realized from the orbital elements and higher resolution photos that the comet was fragmented by Jupiter’s gravitational field, captured, and would impact Jupiter at the next perijove or whatever that’s called. I’m not sure about the 6 teratons, but note that Jupiter’s gravitational field would accelerate the comet close to escape velocity, and that would provide much greater kinetic energy for the collision. I saw the impact sites with a small telescope. The expectation before impact was that a larger scope would be necessary, so it was quite delightful to see dark spots in person. Gene Shoemaker convinced the scientific community that the Moon’s craters were from impacts, not volcanoes. While he didn’t make it to the Moon until after his death, it was wonderfully appropriate that he should find the first comet we saw hit a planet. Well there would be a lot of water turned to water vapour rather quickly. How much would depend on the size of the meteor. You know that real GHG that the MSM never talks about? The one that dwarfs all the others combined. Yea, that water vapour. That’s the accuracy window of a Melbourne train..
occur more often than is believed but in very remote areas. A large asteroid struck the ocean just off of Chesapeake Bay around 35.5 million years ago (http://www.thelivingmoon.com/43ancients/02files/Earth_Images_10.html#Chesapeake). It’s estimated that the wave produced was so tall that it may have streamed over the Blue Ridge mountains. We may have just passed through a bit of a swarm, Last wednesday In victoria Australia I saw a large meteorite traveling horizontally dull red, it then broke into four dull red parts and slowly faded. The big one might have a lot of mates with it. The one I saw last night was red. Same colour as a car taillight. At least we have a good model for Tunguska now. The Russian meteor was about 10 tons, was emitting a massive amount of EM light energy as it rapidly burned-up in the atmosphere, airburst 10 km to 30 kms high, shattered windows, damaged buildings, knocked a few people near the airblast off their feet and left no real crater (no fragments from the meteor have been verified that I am aware of). Airburst. The Tunguska meteor was about 500,000 tons, emitted a massive amount of light and heat energy as it rapidly burned-up in the atmosphere (friction and gravitational potential energy converted to real EM energy – just want to get some controversy goin’), enough light and heat energy to set trees on fire 20 kms away and 5 kms to 25 kms below the object (maybe 40 kms total distance), airburst 5 kms to 30 kms high, knocked trees down for 20 kms around, knocked people off their feet 50 kms away and left no crater. Airburst, 500,000 tons converted to dust, vapour and energy. I guess I’m interested in where the energy came from – it has to be held in the molecules in the first place. Tunguska in 1908 was just a lot bigger than Friday’s Russia meteor. A very strange trajectory for an asteroid. I always believed that asteroids orbit the sun in the same plane as the planets do, and only comets can come in across the plane. It sounds as if there are asteroids in orbits whose planes are perpendicular to the ecliptic. Very strange. I think the Russian meteor also tells us that the last thing we want to do with a 500,000 ton Tunguska/DA2014 meteoroid is blow it up in space while leaving the debris moving along the same track and just create 50,000 10 ton Russian meteor airbursts scattered all over the planet. Take the hit instead or move its trajectory. It says that an event capable of knocking down trees occurs once in every 300 years, or once every 1000 years over land. It does not say how far those trees would be from the point of detonation of the asteroid and how large the asteroid would be. The Tunguska event was equivalent to a 12 megaton (700 Hiroshima bombs) detonation at an altitude of 6 miles and knocked down trees over an area covering 850 square miles. If a Tunguska event occurred once every 300 years, the historical record and oral traditions of pre literate cultures would be littered with such events and it is not. The animation of the flyby. that is not it’s relative speed. It’s speeded up. I’d be inteterested to see a animation of it’s true flyby speed. back to revelation 8 and the two ‘trumpets’. See anything…………familiar?? ‘…….The second angel sounded his trumpet, and something like a huge mountain, all ablaze, was thrown into the sea. A third of the sea turned into blood, 9 a third of the living creatures in the sea died, and a third of the ships were destroyed. Neither comes anywhere near Earth, and both are main belt asteroids. Don’t let him waste yours. Not sure but think how much energy you would have to use to get 500.000 tons to move at the silly speeds they usually have. And then think of Earths atmosphere as braking these objects quickly. It’s severe friction together with kinetic energy? that makes the surface of these objects silly warm? What is the specific ultimate source of the energy that causes friction force to make an object hotter. What causes matter to heat up when it falls into a gravity field. Where does the heat come from when a gas is compressed. I’m thinking along the lines of E=MC^2. In a fission or fusion reaction, Mass is lost in the reaction and that lost Mass gets converted to electro-magnetic radiation (photons) and kinetic energy (particle radiation). The C^2 makes this an extremely energetic reaction. The source of the energy is that the total amount of Strong Nuclear Force required to keep the nucleus of the new element(s) together is lower after the reaction. This is what is really converted to EM and kinetic energy. The Neutrons/Protons in the nucleus of the new element(s) can be bound together with less Strong Force required. And the Strong Force is extremely strong over extemely small distances. I guess it is also related to mass then and the Higgs field. Friction energy could be created because the particles in each individual molecule have a certain amount of kinetic energy and when those particles are compressed by another molecule, the kinetic energy is redistributed/given up until the compression ends and the particles in the molecule bounce back to their previous state. A temporary release of energy. But I’m looking for the actual physics source which makes objects heat up from friction and from falling into a gravity field. How does it actually do this. The cores of developing Stars heat up to 10 million Kelvin before any type of fusion reaction occurs. Brown Dwarf Stars/Jupiter/the Core of the Earth stays hot for billions of years even though there is no nuclear fusion. Meteors heat up from friction (and falling into a gravity field like mass in a star). But what Force is tapped into to generate this heat (EM radiation). When compared to the areas of dense human habitation, the world is a pretty big place. If you combine the surface areas of remote regions such as the oceans, Gobi desert, Siberia and eastern Russia, desolate areas of India, the middle eastern deserts, northern Africa and Sahara, along with the remote areas of Australia, Northern Canada, the arctic and antarctic regions probably 85% or more of the planet are so remote and sparsely populated that an event of the Chelyabinsk class would almost go unnoticed except for a few local herdsmen. That means that the general public is only made aware of between 1/6th and 1/7th of the actual number of such events. Estimates are that about 500 impacts a year actually reach the ground but only a handful are significant enough to show up on weather monitoring systems like radar or weather satellite images. Frequency of a Chelyabinsk class impactor (10 meter) is estimated to be about a once every 10.5 years or so event. That being said, since such encounters are assumed to be totally random there is no reason at all that would prevent multiple impacts occurring over a short period of time, as random events occasionally cluster. If however as discussed in the book “Black swan (N. Taleb)” encounters with large impactors could actually be long tail distributions rather than truly Gaussian random events, it is conceivable that there could be periodic clustered events over long time scales. Science already recognizes this in the late heavy bombardment period theory, there is no reason to exclude the possibility that something stirred up the Ort cloud or the asteroid belt and some day in the future we could experience a period of much more frequent encounters with near earth objects, and our puny historical record may totally misrepresent the true probability of such bombardments on the longer scale time periods. It would be wise to use our technological means to set up a planetary monitoring system which would have a reasonable likelihood of identifying objects larger than or equal to the Chelyabinsk object prior to impact, even if the warning was only a few hours or 10’s of minutes that would be useful information to have available for people to take protective actions..
A good illustration of the science illiteracy here [and in the media]. It is also estimated that the meteor was 10 meter across. Such a body would weigh of the order of 10,000 tons, not 10 tons. Where does the heat come from when a gas is compressed. From the work done compressing it. You have to expend energy compressing the gas. That energy is put into the gas and makes it hot. Mass and kenetic energy(speed of mass hitting the Earths atmosphere)? I guess I’m interested in where the energy came from – it has to be held in the molecules in the first place. Every object that is in motion has kinetic energy. This energy depends on its mass and velocity given by the equation E = 1/2mv^2. And if there is a great decrease in v, then the energy usually manifests itself in the form of heat. If an object fell on the moon, which more or less has a vacuum, then the heat comes on contact with the ground. On Earth, the atmosphere slows things down and the difference between 1/2mv^2 before contacting the atmosphere and afterwards determines the amount of heat produced. Of course when sound is produced, and other energy conversions occur, they have to be factored in as well such that the total energy is conserved, regardless what form it has at any time. Kinetic energy is also relative. For example, if you were on a train going 100 km/h, and you held a rock in your hand, the rock would have no kinetic energy relative to you. But if you held the rock outside a window and let it go just before hitting someone, it could kill that person because relative to the person that is not moving on the ground, the rock has a huge amount of kinetic energy which could be deadly. The effect is dependent upon gravitational tidal forces, i.e., the difference in the gravitational force felt by the side of the object closest to the gravity source and the force felt by the side farthest away. The near side accelerates more quickly in the direction of the gravity source than does the far side (because the near side is closer to the source, the pull is stronger than the pull on the far side), stretching the object, and possibly tearing it into pieces. With small objects, the difference is not large enough to pull them apart, unless they’re extremely close to a very small, but very strong (e.g., a black hole) source of gravity. For instance, if you’re free-falling after jumping from an aircraft with your feet down and head up, your feet would feel the earth’s pull more strongly than your head, but because the distance from your feet to your head is very small, the effect is very small and not enough to overcome the forces that bind your parts together. I was looking for this magnetic cycling in stars and this meteorite event happened so I thought, what if this was just a tiny hand-sized rock wrapped in compressed gas? That would explain why not lots of evidence of meteorite explosion. And Tungusta also. The Oort shell makes us a bubble system (?) so inside we are very compressed? Luckily, it also hit off center and so travelled horizontally, or slightly less than, extending the time it was in the atmosphere where molecules could whither it down. Had it hit perpendicularly, it may have made it to ground relatively intact. Had it hit the ocean in such a scenario, super cavitation would play a role perhaps, until it hit the ocean floor even (maybe?). The size of the resulting Toon Army needs to be determined, the role of supercavitation in such a vertical descent into the ocean, and what can be done in the event a inbound perpendicular collision is imminent, known, and forcasted. I think you can safely call BS on eco-geek’s “Itys” fantasy. I did find another reference, in a Jan 12 2012 comment on sott.net, and it’s a hoot. My favorite is the claim that it’s in Earth orbit and travelling at 10.5 miles per second, when Earth’s escape velocity in LEO is only 10.9 km/s or about 6.8 mi/s. But the idea of an object 2-4 miles in diameter passing through Earth’s atmosphere about once a decade and staying pretty much unnoticed isn’t far behind.